We have fun stock boat flags as well as the ability to create custom boat flags. 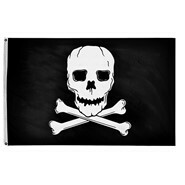 Jolly Roger flag is also referred to as a pirate flag, skull & cross bones , or even a Jack Rackham flag. It is made of nylon and finished with a white heading and two brass grommets. 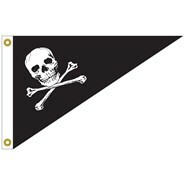 This Jolly Roger Bow Pennant is made of nylon and measures 10 x 15 inches. It is finished with white canvas heading and brass grommets. 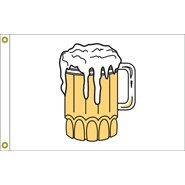 This Beer Mug Flag is made of nylon and measures 12 x 18 inches. It is finished with white canvas heading and brass grommets. 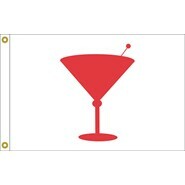 This Cocktail Time Flag is made of nylon and measures 12 x 18 inches. It is finished with white canvas heading and brass grommets. 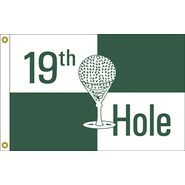 This 19th Hole Flag is made of nylon and measures 12 x 18 inches. It is finished with white canvas heading and brass grommets. 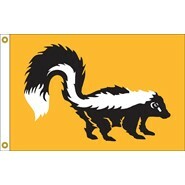 This Skunk Flag is made of nylon and measures 12 x 18 inches. It is finished with white canvas heading and brass grommets. 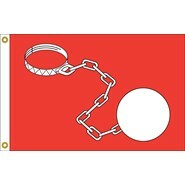 This Wife On Board Flag is made of nylon and measures 12 x 18 inches. It is finished with white canvas heading and brass grommets.